This king remained unknown (mistaken with his almost homonymous of the Ist dynasty -Semerhet-) until 1950s. 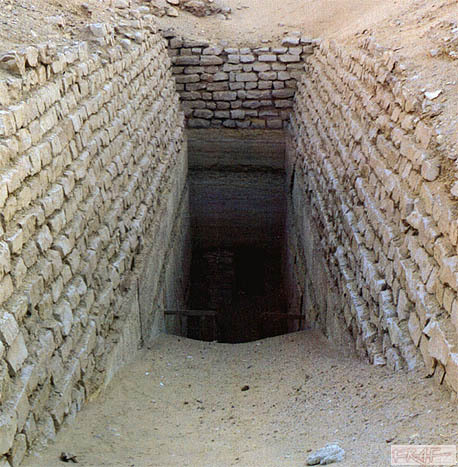 By this date the poor Zakaria Goneim began the excavations in the Saqqara complex south of Djoser's one. The enclosure wall was 340x183 m. then enlarged to the size of 523x194 m; the inner core of the wall in local limestone was coated by well cut blocks of white limestone united by mortar, sand and clay; the course, as for his predecessor's, was in the 'palace facade' (niches and juts) design; the name of Imhotep has been found among the graffitos and red ink inscriptions on the wall (Z. Goneim, Horus Sekhem-khet, 1957 pl.13; D.Wildung 'Imhotep und Amenhotep' p.12). The pyramid was arranged to reach c. 70 m. in height, on 7 steps, but only few meters of it still remain and the monument never reached the 15 meters because it remained unfinished. The base side is 120 mt. 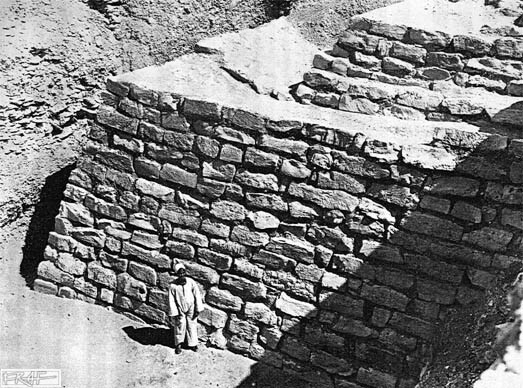 The stone was cut in blocks of the average size almost double than the ones of Djoser and they also evidence better skill in their cutting and assembling. A reused block was found that had to come from Sekhemhet's father (?) complex for it bore the name Neteryhet (Goneim op. cit. p. 8 fig. 26). At the end of the long north-south ramp, under what would have been the pyramid, few corridors starting from the main one (20 - 30 m) have a much more ordered and symmetrical course. Just equidistant from the northern side of the pyramid and the beginning of the ramp, there's a long corridor with comb-like plan going east-west for more than 150 m. before a right angle southward bending at both its extremes; after the change of direction the two corridors run parallel, at c. 150 m. of distance one from the other, for 76 m.
The 'South Tomb', a mastaba placed closer to the pyramid south side than the one of Djoser's complex, was entered by a west-east descendant slope that met, under the mastaba, a 30 m. deep pit; the crypt was reached only in 1967 by P. Lauer (after the excavations had been stopped for the tragical death of Z. Goneim). The south tomb funerary chamber contained a wooden coffin with child bones remains, stone vessels and some fragments of pale gold leaf, lapislazuli and carnelian labels: they once covered all the chamber walls. Many other objects were found under the pyramid: hundreds of jewels, stone vessels (with the Horus name of the king and not hollow within) were on the ramp floor beside the pit; at the bottom of the pit an ivory tablet had on it a brief phrase 'Nebty Djoserty Ankh' (Life to the Nebty Djoserty) giving us the possible (cf. also the update below) Nebty name of Sekhemhet (Goneim, Horus Sekhemkhet, 1957, 21; Lauer, in: BIFAO 61, 1962, 25-8; contra Helck, in: WZKM 54, 76ff. : a person name built with the Nebty suffix). For a further possible interpretation of this name as that of a queen Djesert(.i) Nebty see below. The reading of Sekhemkhet's name was ensured by the finding of fragmentary clay seal impressions (Goneim op.cit. p.14 ff). 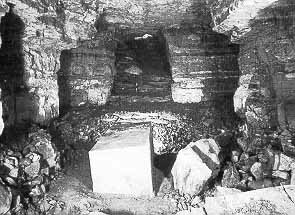 The alabaster sarcophagus of the pyramid funerary chamber, the oldest known in hard stone, was found untouched; but once it was opened (1954) it strangely resulted empty, although sealed by plaster and covered by a flowers garland; the monolith, of 2,35 m. in length, had no lid but its opening was on the minor side by a kind of 'T' section sliding portcullis (Goneim 'Horus Sekhemhet' 1957, 1956; Lauer in R.d.E. 20 p.197-207; M. Wissa in OrMonsp IX.-FS Lauer-1997 p.445-7; see fig. below). The complex of Sekhemhet has never been open to the public for its conditions aren't safe for tourists: recent earthquakes have evidenced deteriorations that also afflict the underground galleries of Djoser (closed too): see E.D. 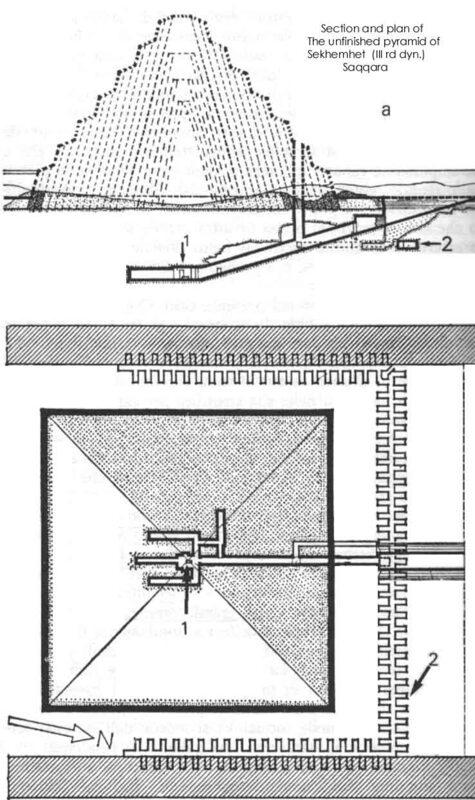 Johnson 'The need for Seismic Analysis and planning... Saqqara' in J.A.R.C.E. 36 (1999) p.135-147. The works on the surface had thus just begun when they were interrupted probably by the king's sudden demise. In the northern funerary temple only the floor had beed completed whereas the sebterranean were almost ended: then it seems quite reliable the reign duration of Sekhemhet, 6 years, as reported on the Turin Royal papyrus. 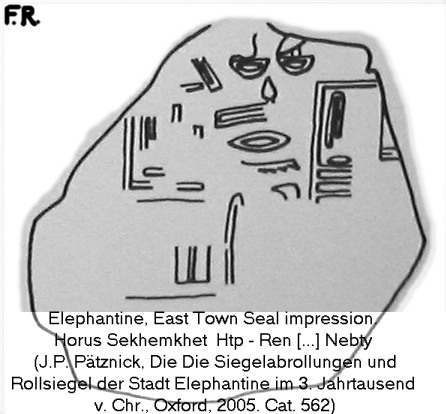 If we exclude the material from his Saqqara funerary complex, the name of Sekhemhet is rare enough, on seal impressions too; one of these, along with the Horus name, mentions the Governor of Elephantine (J.P. Pätznick in M.D.A.I.K. 51, 1995 p. 179-184; see also id. in M.D.A.I.K. 55, (1999) p.166-173); this island, after the protodyn. period-Ist dyn. (fortress bastion under the Museums' gardens and beside-under the temple of Satet) and the end of Second Dynasty (Peribsen seals) seems to have been integrated in the state organization building projects as early as the Second and certainly later in the Third Dynasty as attested through Netjerykhet, Sekhemkhet, Sanakht and Khaba seal impressions and Huni's granite cone. The foundation of the fortress remounts to the middle of the 1st Dynasty (Phase A,1 = middle- to late- 1st Dynasty). It's not to exclude that further findings from Elephantine might clarify the succession of the Thrid Dynasty rulers. M. Wissa (op.cit. 1997 p.445-7) advances that the reign length, basing on the materials found in S. complex, must have been superior to 6 years (Turin Canon), although not perforce up to 19 as proposed by N. Swelim ('Some Problems...' p.221). The Wadi Maghara (Sinai) rock carvings present this king in the ritual gesture of smashing the enemies' heads by a mace; other two nearby reliefs show Sekhemhet (>figure above); no other representation of this king is known to us. 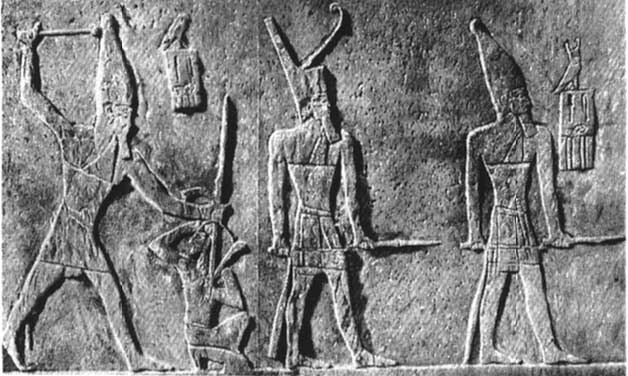 Only in the '50s there was the correct attribution to Sekhemhet of the serekhs once thought naming Semerhet of the 1st Dynasty. The name Tety, attested on ramesside royal lists, never appears on a IIIrd dynasty monument but it could be a derivation of the -Ty in the nebty name Djoserty. 'Itety' is attested on the Abusir Papyri from the temple of King Neferirkara Kakai (3rd of the fifth dyn. but the papyri date to the end of the fifth dynasty) where it seems that a cult of a statue of Itety was held (cfr. Wildung 'Die Rolle ... 1969 p. 94-100). Last mention goes to a late period statue (Persian) of a priest of Djoser-Netheryhet, Djoser Tety and Tety, that thus makes a clear distinction among Sekhemhet (Djosertety), Djoser and Tety; the III dyn. placing seems here out of doubt. (cfr. on this matter Smith in C.A.H. I pt.2 (1971) pag.150 and 156 ; Erman in Z.A.S. 38, 1900 p. 115). The already mentioned inventory-scribe ivory plaque from his mortuary complex clearly shows on the right Sekhemhet's nebty name Djosert(y) (published in Goneim 1957 pl. 66), even if it has been argued that this could be a Queen's name. W. Helck (in W.K.Z.M. 57, 1957 p. 72-6) supported by a study of Schott (cfr. Lauer's article on the plaque in B.I.F.A.O. 61, 1962 p. 25-8) had deduced that no Nebty name existed before Snofru, and the name Djosert-Nebty could have been that of a queen; Lauer adduced the examples of the use of Nebty in the titulary of Semerkhet (Irj-Netjer), Qa'a (Sen) and Ninetjer (=). My learned friend John D. Degreef once expressed his doubt about the Nebty as title too; but he proposed that this could have been the object of the king-name's sentence, i.e. Sen-Nebty, with hieroglyphical honorifical inversion, would be 'He who sniffs (or he who Kisses) the two ladies'. He also indicated me that a similar name appears on one of the beer jars found at Elephantine (published in FS Fecht, 1987 by the same W. Helck): perhaps in the reign of Huni an eponymous event names the Wrt Hts queen Djefat(.i) Nebty. Helck didn't returned in the 1987 article on the question of the archaic value of Nebty. It's possible that a double use was made of 'Nebty' (as for the kings' cartouche-names of later O.K. person- names): as royal title as well as in private names like a kind of teophorous element. 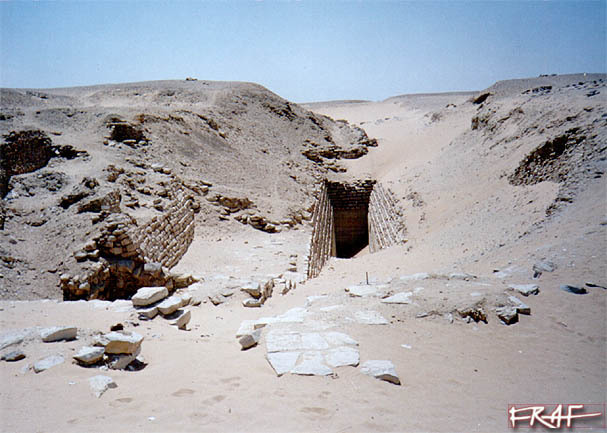 [Update 2007] A new important element in the problem and more generally about the sequence of early Third Dynasty has emerged after J.-P- Pätznick studies of Elephantine sealings (cf. Jean Pierre Pätznick, Die Siegelabrollungen und Rollsiegel der Stadt Elephantine im 3. Jahrtausend v. Chr., Oxford, 2005. - Exkursus I: Die Abfolge der Horusnamen der 3. Dynastie, p. 76-79). A seal impression from Elephantine East Town (ibid, p. 76ff., note 801; p. 567, cat. 562) preserves part of the "Nebty name" of Sekhemkhet: HTP-ReN [...] Nebty. Now there is already a possible Nebty name of this king, which was found in his Saqqara unfinished monument, on the linen tablet discussed and shown above. A series of considerations, not last the ones about the furnishing and sealing in Sekhemkhet's pyramid, leads Pätznick to propose that this pyramid could have been started in the reign of the king whose "Nebty name" was preserved on the plaque (Djeserty Ankh Nebty) and whose Horus Name would be probably Sanakht. 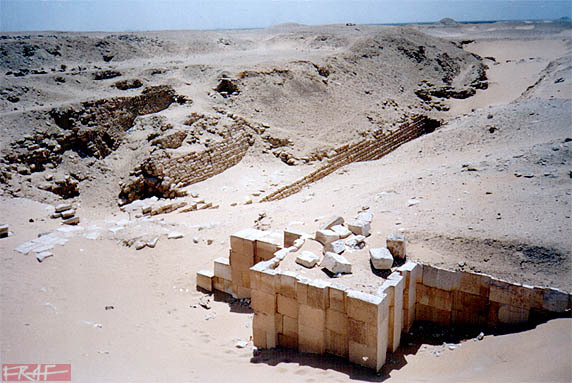 Sekhemkhet's impressions should have to be related to the posthumous expression of a kind of filial pity (as was the case with Sanakht's sealed vases deposit in Djoser's funerary temple of the SPC and of the latter king with Khasekhemwy's Abydos tomb); this would also indicate a likely direct family relationship of Netjerykhet, Sanakht and Sekhemkhet. The Wadi Maghara reliefs would also support this succession, for Sanakht's one(s) were carved much closer to Djoser's than were those of Sekhemkhet (ibid., 78). Also the mixed sealing finds from Bet Khallaf mast. K2 would stress the direct link between Djoser and Sanakht. 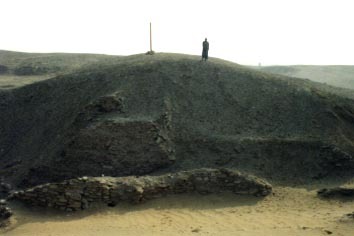 Therefore it is possible that it was Sanakht to start the Pyramid south of Netjerykhet's complex. Sekhemkhet's funerary complex would be in this case either still unknown, or this king eventually took over his predecessor pyramid complex but without being able to finish or even to add much to the monument he appropriated (possibly for the same reason Sanakht left it uncomplete: the premature death of the sovereign). The abrupt end of Sekhemhet's reign, threw the egyptian state in a period that seems having been quite critical. We can tentatively guess that the great Imhotep survived to Djoser and was again the mind behind the funerary complex works; the project is by far a more contemplated one, with few updates or modifications. The size of the pyramid and of the underground locations clearly bears the trade-mark of the great Imhotep, who is now not improvising anymore or refining previously built architecture; he is also very conscious of the possibilities of stone masonry. Only the enclosure wall underwent a size increment; no time for other additions in the few years lasted works. The monument of the follower, Khaba, was planned to blindly repeat Sekhmhet's; a sign of reverence for whom should have been Sekhemhet's architect; but we 'll see that it will only be a simpler and smaller complex, sign of the lack of a superior mind at the head of its accomplishment (not of its older date as it has been proposed), and destined to remain unfinished as well.